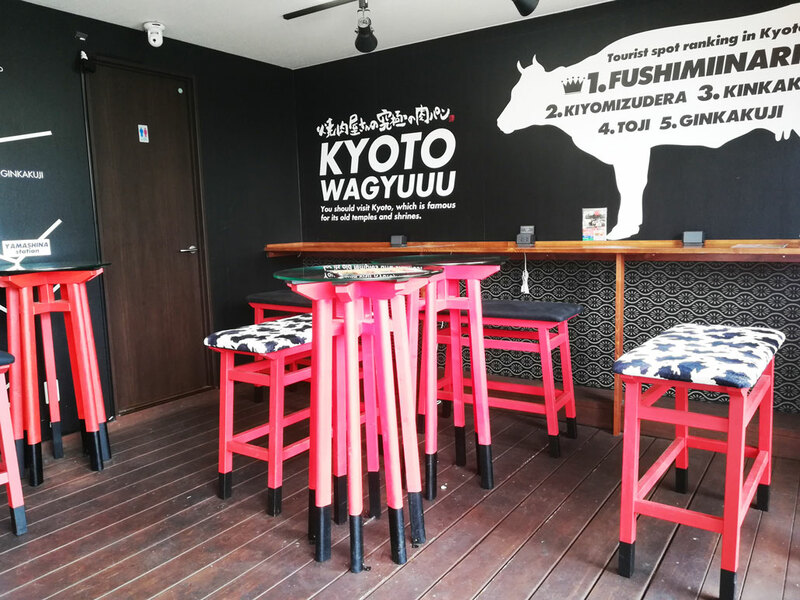 In December 25, 2017, a Wagyu beef hot dog shop Wagyuuu opened near the famous shrine in Kyoto, Fushimi Inari Taisha. 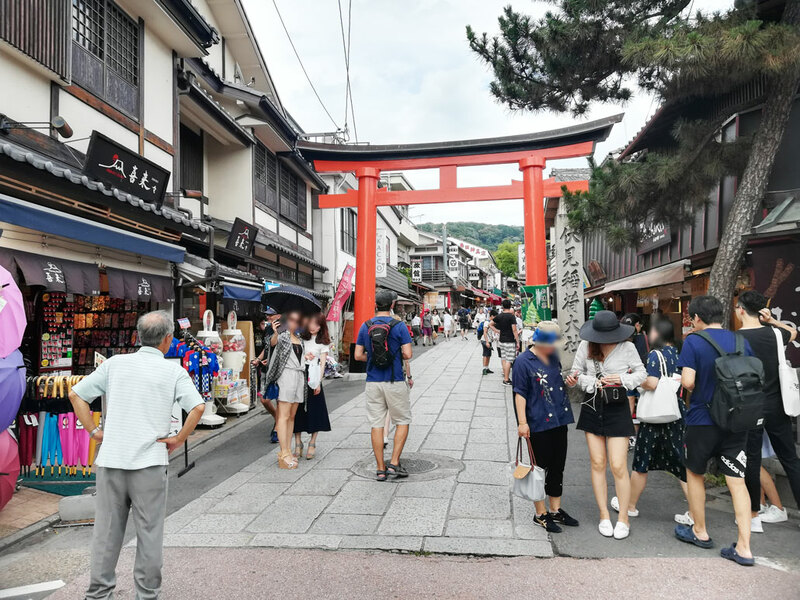 According to TripAdvisor, Fushimi Inari Taisha has been in the number 1 position for 5 straight years in “Top 30 Attractions in Japan by International Travelers 2018.” This is why there are lots of tourists in this area. 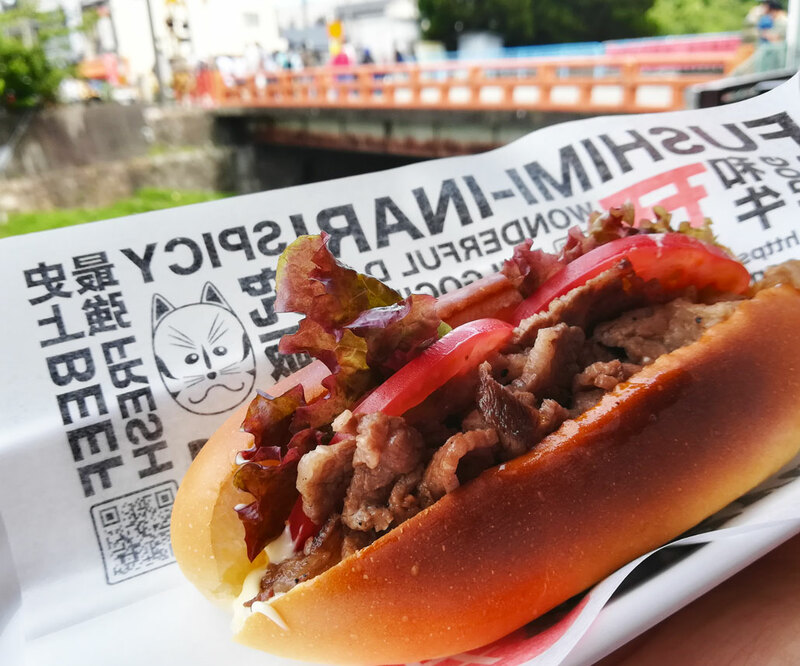 Why not visit Fushimi Inari Taisha and have lunch at Wagyuuu? Near the side approach to Fushimi Inari Taisha, there are Inari Station (JR Line), Fushimi Inari Station (Keihan Line) and a railroad crossing. From the shrine, walk down the side approach and go straight. Wagyuuu is located just after the crossing. It takes only about 1 minute on foot from the shrine or either station. 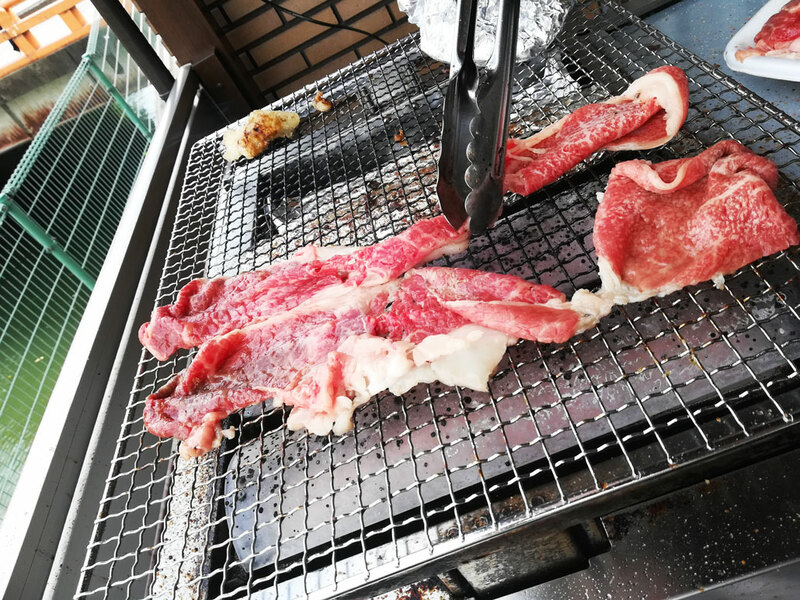 Wagyu beef, literally meaning “Japanese Beef,” is a premium quality brand of beef in Japan, and these days the brand name is getting more and more famous in the world. 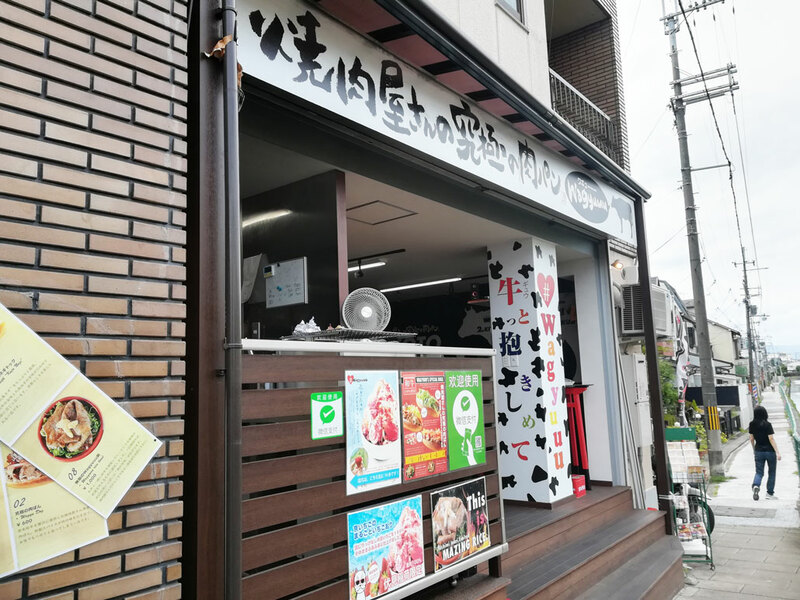 In Shijo Omiya, Kyoto, there is an authentic grilled meat restaurant Nikumon, and they decided to make special hot dogs with their Wagyu beef. The new hot dog shop is Wagyuuu. The beef they use is only Wagyu beef, so their hot dogs are luxurious and taste great. It is also good that the beef is grilled after ordering. Fushimi Inari Taisha is famous for having countless torii gates. When I went into the hot dog shop, I found tables and chairs in the motif of the torii gates. Look at the next picture. Some chairs have the white and black cow pattern on them, too. What a unique collaboration! On the walls, there are a map of Kyoto and “Tourist Spot Ranking in Kyoto.” It must be fun to wonder where to go next, or chat about the memories of the trip, while eating a tasty hot dog. On the menu, you can see pictures of each food item, so it is easy to choose, though it might be difficult to decide what to eat because there are various flavors of hot dogs, such as Italian basil and Korean bulgogi. They have menus in English, Chinese and Korean, too. I had “Wagyu Dog” (600 yen). The beef was juicy, flavorful and rich in fat. It was addictively delicious! The bun was crispy and really good, too. They went well with the mild, creamy flavor of mayonnaise. Usually Wagyu beef is very expensive, so it is wonderful that you can try it for such a reasonable price. It was a hot day, so I had strawberry shaved ice, too (small size / 500 yen). 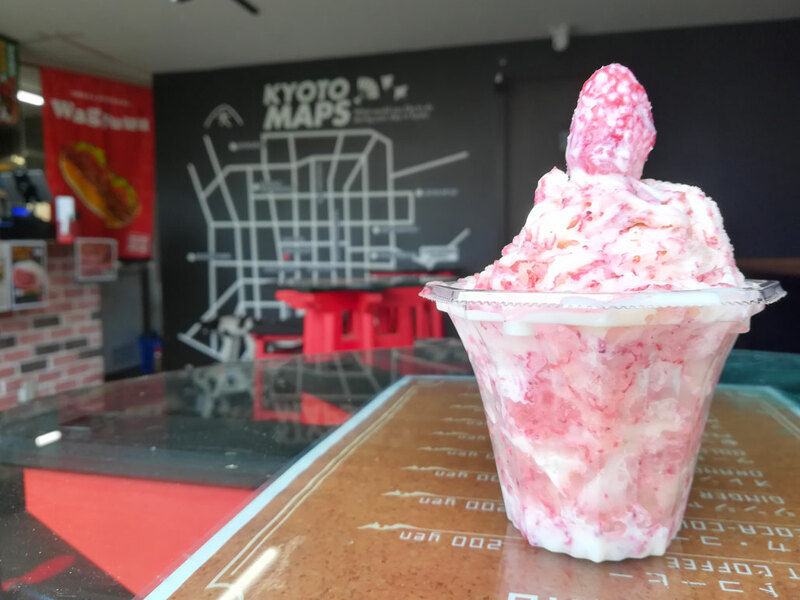 It was rich in strawberries, and only Kyo Ichigo (strawberries harvested in Kyoto) were used in it. How lovely it looks. The ice was airy and fluffy. Also, there was “Kujonegi Dog,” a Wagyu hot dog topped with plenty of chopped Kujo-negi. The Kujo-negi is a Welsh onion that is one of Kyoyasai, or traditional and quality vegetables in Kyoto. For those who want to eat rice, they have rice bowls with Wagyu beef, too.